Concertino in Hungarian Style. Composed by Oskar Rieding. Edited by Kurt Sassmannshaus. Stapled. Barenreiter's Concert Pieces. Instructional. Piano reduction, part(s). Opus 21. 41883 pages. Baerenreiter Verlag #BA08973. Published by Baerenreiter Verlag (BA.BA08973). ISBN 9790006539253. 30 x 23 cm inches. Key: Key: a minor. Text Language: German/English. Preface: Kurt Sassmannshaus. 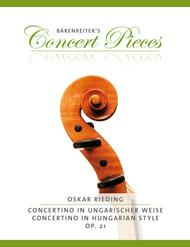 Oskar Rieding's Concertino op. 21 uses 1 st and 3 rd position exclusively. Hungarian echoes in the Andante sostenuto on the high and low strings of the violin and extensive semiquaver (sixteenth-note) passages in the Allegro moderato require basic dexterity in the left hand combined with frequent use of accented bowing in the right hand. The edition contains a solo violin part and a piano reduction for the accompanist. Editor is Kurt Sassmannshaus, the internationally-renowned violin teacher and co-author of the Sassmannshaus violin school tradition. His foreword introduces this little gem and includes tips for successful first concerts.